Tez Watson tells the Gurn: "My wife, Sandra is undertaking a 100Km night cycle ride in London at the end of May along with 2000 other women. She's raising money for three women's cancer charities and we're having a Race Night across in Portsoy this Saturday night which will also feature a charity auction. 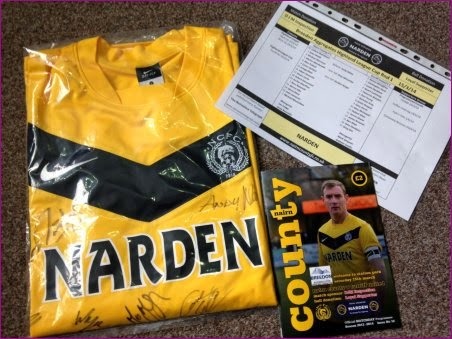 Nairn County have kindly donated a signed strip which comes with a certificate of authenticity, the team sheet and programme from last Saturdays Cup match against Turriff. We're inviting bids for it from the Nairn Community - a great chance to own a great shirt. People can ring the shop for more information 01667 456126 or to place bids." Tez can also be contacted through the Iolaire website.